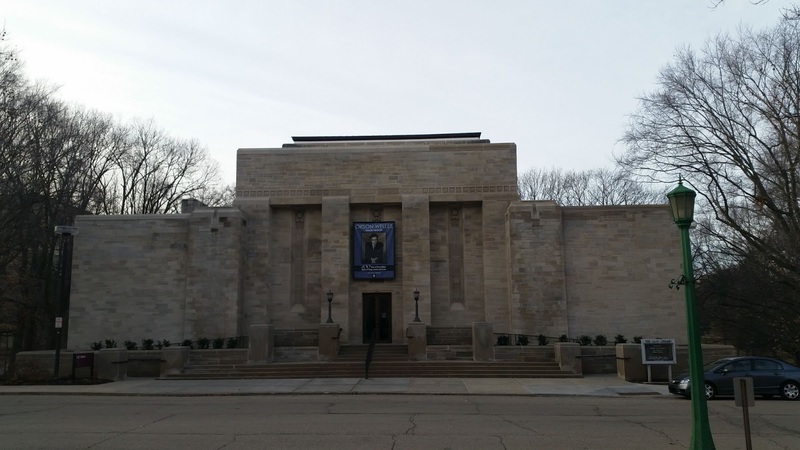 From 16-19 March, I was at the Lilly Library, Indiana University at Bloomington, working with the Sylvia Plath archives there doing reference leg work and inquiry for the Letters of Sylvia Plath project. In the past, I have made nightly updates on the materials with which I worked, but I found this too time consuming for the kind of work I was doing this time around. In the process of being there, I was able to look through the majority of all the boxes and folders in Plath mss II; as well as dabbling a little in other, smaller collections such as the Lameyer mss; Plath mss IV; Plath mss VI; and one book from her library, Christopher Fry's 1950 play The Lady's Not for Burning. The trip was very successful and rewarding, and the staff, from the Curator of Manuscripts Cherry Williams to Reference Librarian David K. Frasier and Public Services Assistant Zach Downey, and all the additional library staff who paged materials, brought them to me, took them away, and let me stay until the exact closing time, did everything they could do to make me feel welcome. This was IU's Spring Break, and so the campus was quiet and the library open one hour less each day. I missed those hours, but was happy to trade that loss for the benefit of a ghost-town like feel to the campus. 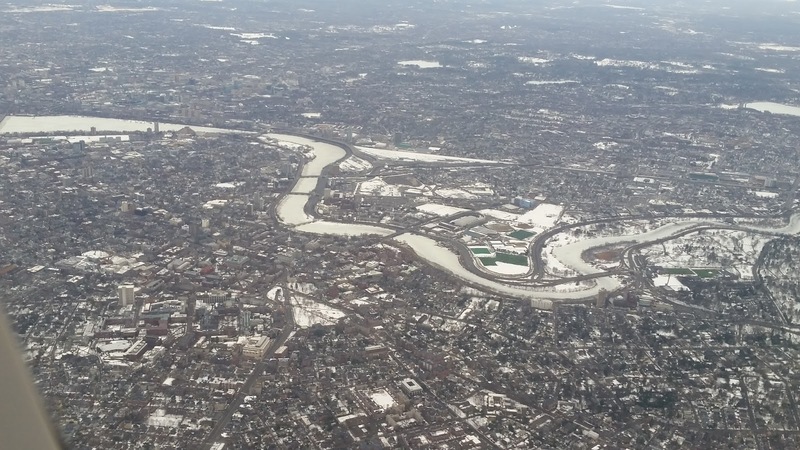 Leaving snowy Boston was bittersweet, but I was greeted by unusual things such above freezing temperatures, grass and sidewalks. Research commenced at 9 am sharp on Monday and I worked with the correspondence first, looking at the originals of letters I had copies of to see if any unclear bits were discernible. Then I worked with Plath's earliest diaries from 1944 and 1945 as well as the small envelopes of loose materials removed from the diaries. From there, I worked with Plath's "Publications Scrapbook" in Box 15. It is truly an honor to work with these materials and to see and hold diaries, documents, photographs, menus, matchbooks, ticket stubs, theater programs, etc. that Plath used to own. The Publication scrapbooks hold letters of acceptance for her work, telegrams, and other memorabilia of her life as a professional writer. It shows the concentrated focus that he had for this profession from a very early age. Moving along to Boxes 11 and 12 which hold "Smith College Memorabilia", I found some fascinating materials. Again, all of which was proving useful to be able to write good contextual reference notes and annotations to Plath's letters. I am gaining a far greater understanding and education on Plath's early life. This is vital, I think, as so much attention is given to her post 1956 doings when she was a professional teacher, writer, wife, and mother. In the process of this day, I made an exciting discovery. But then it was closing time. On Tuesday I picked up where I left off in Boxes 11 and 12 and right off the bat found a letter I previously did not have listed in my files. This was an excellent way to start the day, which ended having found several more letters in a variety of places! This makes for more work, but it is work happily done. After I wrapped up with these boxes, I moved to two of my favorite Plath documents out there: her high school and Smith College Scrapbooks, housed respectively in Oversize 3 and Oversize 8, and spent the bulk of the day playing with these. The scrapbooks are glorious documents of Plath's life, colored with creative and fun captions, illustrated with the stuff of her life. Some of those things mentioned above like programs, menus, matchbook cases, photographs galore and other wonderful things. Having no idea how many times I have visited the Lilly, I do know that each visit I look at these scrapbooks and I gain more and more information with each time. This is something the archive does. Your own knowledge and perspective shifts and expands, so re-visiting a collection or a document can yield wonderful insight. On a project like the letters, which I have read through three times completely so far, documents like the scrapbook practically scream with newly relevant information. Continuing with the oversize materials, I looked at the Clippings in Oversize 10 and ended the day in Box 13, which holds materials relating to Cambridge University and Plath's teaching year at Smith College. Also on this day, a former Smith College student and current student at IU's Library school, Amanda Ferrara, found me and so it was wonderful to see her and to chat. You will remember Amanda from her excellently curated The Bell Jar exhibit that was on at both Roger Williams University and Smith College in 2013. On Wednesday I worked with Boxes 7a and 8 which hold Plath's poems and prose among other materials which include an early scrapbook of poems, the typescript for "Circus in Three Rings", a manuscript she put together in her last semester at Smith College; the typescript of The Colossus she submitted to the Yale Series of Younger Poets, In looking at this and in particular at the very massive list of Acknowledgements, a thought occurred to me that perhaps Plath did not win because she was too accomplished a younger poet. Also looked at Oversize 1 ("Awards"), 2 (The Bradford), 10 (those clippings again), and Oversize 11 ("Clippings Miscellaneous"). In 10 I particularly enjoyed seeing clippings that Plath sent, signed with a note, to Olive Higgins Prouty, as well as that famous one of "Sylvia Plath Tours the Stores and Forecasts May Fashions Week" where she typed on a clipping of her in swimsuit "with love, from Betty Grable". Thursday was wide open as I had largely worked through everything I had wanted to by the end of the day on Wednesday. So, I started the day looking at Plath's other early diaries from summer camp 1945 through 1949 (with an entry or two from 1951). I looked more through boxes 8 (Poems and Fiction Prose), 9 (Non-fiction prose & Letters Home), and 10 (High school memorabilia) as follow-ups to things I worked with the other days and based on things I had researched on in my hotel in the evenings and in the mornings, too, before the library opened. Looked also at Plath mss VI a small collection of materials related to Sylvia Plath, which had to my surprise some fascinating information. About 90 minutes was dedicated solely to examining intimately (what?) a 1962 letter by Plath to her mother with lights and magnifying glasses; standing up, sitting down, on my knees, trying to read some redacted text. This was the day that I was cramming information in right up until quarter to five when the staff (respectfully) boots you out. By far this was the most intense four day research trip I have ever undertaken. Not that it will do me any good now, but I even learned the combination to Plath's high school locker! Too stimulated to fall asleep, mind racing too fasts to stay asleep, and abandoning sleep altogether I was up generally by 4:30 am going through everything from the day before and mapping out a plan of attack for the day ahead. Does this happen to others? In all, I found eight or nine new letters and one or two other simply fascinating discoveries which I will write about later. When not in the library, I was enjoying to quiet of downtown Bloomington. Though, it being spring break it never occurred to me that places would be shut down, so finding food was made a little more challenging. I found excellent beer and vegetarian/vegan food at the Owlery (and conversation there Thursday for dinner with the aforementioned Amanda). As well, delicious ice cream for dessert most nights at Hartzell's on Dunn Street. The Lilly Library, at this present moment, as 9 Plath mss collections. You can see them all listed nicely here in a general run of alphabetical P collections. I have noticed recently some new information in them, so make sure that you check back regularly for added value information, or even new collections. If that list is too long, I recommend (and prefer) this view. All links accessed 22 March 2015. As I work on a blog post discussing my recent four-days visit to work with the Sylvia Plath materials at the Lilly Library, here is an announcement about an upcoming Sylvia Plath related event. 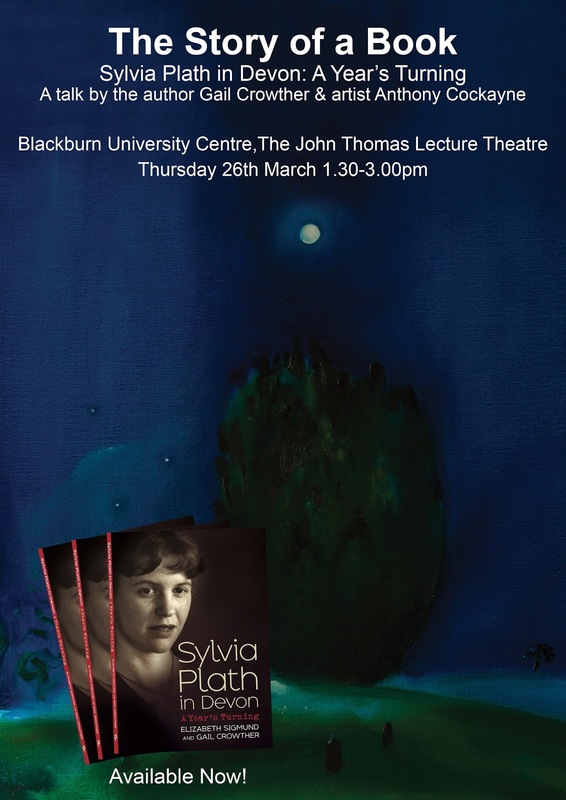 Author Gail Crowther and artist Tony Cockayne will be presenting on Gail and Elizabeth Sigmund's recent Sylvia Plath in Devon: A Year's Turning this Thursday, 26 March 2015 at 1:30 p.m.at Blackburn University Centre, The John Thomas Lecture Theatre (map). The author's will discuss the story of the book, show slides, answer questions, and sign books. Further talks are in the works in locations like Falmouth. More information and details will be forthcoming. I like rare books and I cannot lie! Rare books can sometimes be like watching sports. In sports, on any given day you may see something that has never been done before. In the case of books, you might suddenly see a copy of something that you did not know existed. In December, while browsing around ABEbooks.com, this very thing happened. 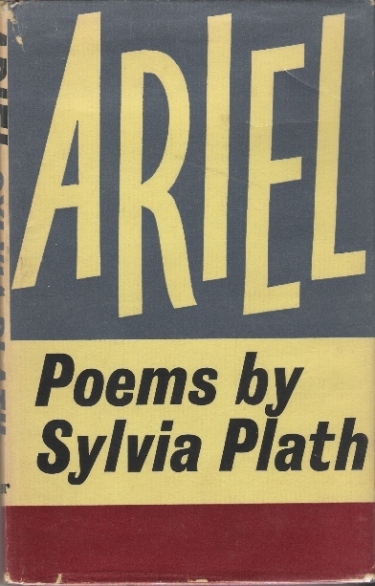 One of the more memorable and famous books from the 20th century, which is celebrating 50 years of publication this coming March, was Sylvia Plath's Ariel. A copy of Plath's Ariel, a Faber first edition, second impression, recently came across my view. But it was unusual. The dust wrapper was different. The first editions that I have seen and held have three bands of color on the face and spine. Blue at the top taking up the majority of the space with the words ARIEL in yellow, as if cut out; then that yellow in the middle with "Poems by / Sylvia Plath" in black, and then a beautiful solid red color band along the bottom, hinting that the the poems inside are a "blood-flush"; "blood hot and personal". However, the jacket presented for sale by the bookseller had as the image the book with only two colors: blue and yellow. Missing is that red band at the bottom. I did a quick search for other examples for sale of the second impression, but all copies with bookseller supplied photos had present the red band. At its price was most affordable, even to a poor archivist like me, so I snatched it up. This particular copy has the stain of a previous owners name "d f gough" on the ffep (front free end paper), but otherwise is virtually clear of other markings throughout the book. It does have one other peculiarity which is present in at least one other first edition, second impression of Ariel that I have seen: the type did not strike fully on the copyright page leaving a gap in the copyright year. Ariel (Faber, 1965). First edition, second impression. Lacking red color band at bottom. Ariel (Faber, 1965). First edition, second impression & sadly price-clipped. With red color band but sadly price-clipped. I have reached out to the archives of Faber to see if they can tell me anything about the book. In some ways the book and wrapper feels like a proof. An email recently from Faber archivist Robert Brown was not able to shed any additional light on the dust wrapper, and it was his suspicion that it was most likely a printing error. I have been unable also to find other examples of this particular impression with this particular two-colored wrapper. Naturally I do not think that does not mean they do not exist, but it is nice feeling that I have something unique. All links accessed 9 January 2015. Sylvia Plath has a reputation. In fact, she has many reputations. Sylvia Plath is most widely known for her life and her death; her novel The Bell Jar, and her poems, most notably those in Ariel but also for those works published in 1981in The Collected Poems for which Plath did, after all, win the Pulitzer Prize. In recent years -- say since 1987 -- Plath's life has been the focus of attention as a number biographies have been published: and most of those with some drama or contention surrounding it. And in 2000, with the publication of her full journals, again the focus was displaced somewhat from her creative writing and onto her life. In some strange and perverse way, Plath's reputation --poetic and otherwise -- is because of Hughes, just as Hughes' own fast ascent as a poet of world-renowned can be credited to Plath who effectively and efficiently got his poems first in a wide array of reputable and international magazines, but also in book form. Fifty years ago today, on 11 March 1965, Ted Hughes saw to publication his version of Sylvia Plath's Ariel. Published in a first run of 3100 copies. But as is very well-known by now, this Ariel was neither the order nor the collection of poems that Plath intended. That notwithstanding, the poems and book were a massive success. According to Stephen Tabor's 1987 book Sylvia Plath: An Analytical Bibliography reprints were quickly issued on "14 January 1966 (3180 copies); 6 July 1967 (2500); and 20 March 1972 (2000)" (21). It was not until June 1966 that the Harper & Row edition was published in the United States. For contemporary readers of Sylvia Plath, the 1965 Ariel represented a severe and marked departure from her 1960 book, The Colossus. In his review of the earlier volume, the critic Al Alvarez wrote, "most of her poems rest secure in a mass of experience that is never quite brought out into daylight [quote from "Black Rook in Rainy Weather"] . . . It is this sense of threat, as though she were continually menaced by something she could see only out of the corners of her eyes" ("The Poet and the Poetess" The Observer, 18 December 1960: 21). With Ariel, Plath confronts these threats which on the one hand confronted her head-on and on the other, needed quelling. The Guardian has a select archive of reviews of Plath's works from the 1960s. Among them is Richard Kell's "The Foil of Despair" from 12 March 1965. Kell writes that "the writer is very much involved in all her poems", an early recognition of a biographical aspect to her poetry. He recognizes that Plath's ability to merge "landscape and mindscape" in "The Moon and the Yew Tree" shows Plath's "writing at her best." But ultimately, Kell seems unnerved by the intensity of Plath's poetry: "But the experiences these poems are 'about' become a kind of foil: if a fine poem of despair leaves the reader despairing, instead of marvelling at the power that can create something perfect out of destruction, the poet's struggle is to that extent devalued, and it is better not to read at all." Alvarez, a more faithful reader and early proponent of Plath's poetry, and one who was more familiar with Plath's progression, reviewed Ariel as well in the Sunday, 14 March 1965 issue of The Observer. The review begins, "It is over two years now since Sylvia Plath died suddenly at the age of 30, and in that time a myth has been gathering around her work. It has to do with her extraordinary outburst of creative energy in the months before her death . . ." Alvarez was the first to "speak", as it were, after Plath's death when he wrote "A Poet's Epitaph" in the Sunday 17 February 1963 issue of The Observer (see an image of that on this page), which also printed four of Plath's last known poems: "Edge", "The Fearful", "Kindness", and "Contusion". In that piece, Alvarez set Plath's reputation going, almost like a "fat gold watch". He writes, "For the last few months she had been writing continually, almost as though possessed. In these last poems, she was systematically probing the narrow, violent area between the viable and the impossible, between experience which can be transmuted into poetry and that which is overwhelming. It represents a totally new breakthrough in modern verse, and establishes her, I think, as the most gifted woman poet of our time. . . . The loss the literature in inestimable" (23). In his Observer review, Alvarez attempts to distance Plath's personal poetry from that of the budding "confessional" school but unfortunately she was lumped in there against her own will. He rightly calls the shift from the poems in The Colossus to those in Ariel "unforeseeable". Alvarez's own view of Plath's poetry matured, just as Plath's poetry itself did. From his review of the Colossus quoted above ("she were continually menaced by something she could see only out of the corners of her eyes") Alvarez claims of Ariel that "the preparation [the poetry of The Colossus] was essential: when the wrenching crisis took place she had the art to handle it." Alvarez named it beautifully when he judged Ariel to be "a major literary event". Ariel by Sylvia Plath, though compiled and edited by Ted Hughes, was and remains a major literary event. It set Plath up as the leading poet of the 20th century. Plath continues to be a force in the 21st century as well. And this is right because of the universality of her poems and their messages, among other reasons. The grip of these poems is so strong that even the long overdue publication of Ariel: The Restored Edition in 2004 has done little to topple the former from being the book of poetry for which Plath is primarily known. The former is collection is so strong and so shocking, still today. I cannot read them without either alarm or an increased heart rate. But the tone of the two books so different. One crescendos in bleak, almost inevitable sadness; and the other defiantly survives the chaos and fire of life. No matter which book you prefer and what message you take from it, read the 1965 Ariel today if you have access to it. The speaker of Plath's "Edge" says: "We have come to far" (Ariel, 85). It is anything but over. Sylvia Plath's worksheets for the Ariel poems are largely held by the Mortimer Rare Book Room at Smith College. A few stragglers are elsewhere such as "Tulips" at the Houghton Library of Harvard, and several including "The Moon and the Yew Tree", "Morning Song", and "The Rival" in Plath mss. at the Lilly Library, Indiana University at Bloomington. All links accessed 18 February and 2 March 2015. On Sunday 2 March 1958, Sylvia Plath wrote a letter to . . . her mother! I know! #Shocking. Wholly omitted from Letters Home but available to read at the Lilly Library, the typed letter was written on the now famous pink Smith College Memorandum paper. Among other things, Plath writes that the night before --1 March-- was spent lazily seeing two films: one on Goya and another on a documentary on a bullfighter. The film on Spanish painter Francisco De Goya (info) was The Glory of Goya (1950) and featured music by Andres Segovia, a musician Plath saw perform at Smith College as an undergraduate on 10 April 1954. The documentary on the bullfighter was the 1956 Mexican film Torero! (YouTube) about the Mexican bullfighter Luis Procuna (info). The film on Goya is interesting as within three weeks Plath was on Spring Break, writing nearly a poem a day and all largely influenced by art, specifically modern art. Also this creative outbreak was inspired by both her auditing of Priscilla Van der Poel's course on modern art (Art 315) and receiving a request for poems from the magazine ARTNews. The course description for Van der Poel's Art 315 course reads: "Contemporary art and its backgrounds from Jacques Louis David and the French Revolution to the present. Open to sophomores by permission of the instructor. Open also in the second semester to students who have had a course in nineteenth-century art abroad. Recommended background, [Art] 11 [Introduction to the History of Art]. M T W 10" (49). The French painter Jacques Louis David (info) was a contemporary of Goya's and both artists likely influenced the work of future artists to which Plath responded to verbally in her Spring Break poems inspired by Giorgio de Chirico, Henri Rousseau, Paul Klee, and Paul Gaugin. The film names above were provided by Dianne Weiland, a College Archives Intern at Smith College. For her help and research on this I am extremely grateful. The films were listed in the 23 February 1958 issue of the Smith College Weekly Bulletin. Grateful thanks also must go to Nanci Young, College Archivist, of Smith College. All links accessed 14 June 2014 and 19 February 2015.